Plenty to discuss after the Allianz league action. 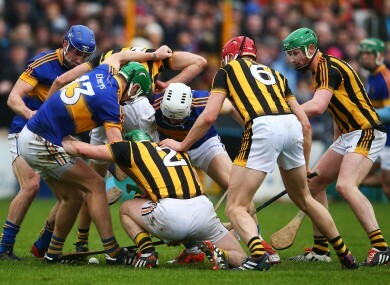 A scrum develops for possession between Kilkenny and Tipperary players. We’re accustomed to Kilkenny and Tipperary producing thrilling and wholehearted encounters, but it’s Croke Park in the autumn that generally conjures up those images. On a bitingly cold February afternoon, the two teams tore into each other today with a vigour that belied the stage and conditions. The frenetic battle kept the 10,892 crowd engrossed yet the narrative concluded in a familiar fashion. Kilkenny’s clinical nature has not deserted them judging by the late goals Kevin Kelly plundered while Tipperary were left with regrets once more at not sealing the deal. With Richie Power retired, Ger Aylward sidelined for the season with a cruciate injury and Richie Hogan withdrawn before throw-in with a back problem, Kilkenny needed attacking leaders to emerge today. Indeed seven days after only mustering 0-10, Brian Cody would have liked to see his offensive options expanded today. Two players certainly put their hands up. St Patrick’s Kevin Kelly finished with 2-1 and St Lachtain’s James Maher wound up with 0-4. Of course TJ Reid pointed the way again with a 0-10 haul yet the contributions of Kelly and Maher served as a good start in their 2016 intentions. Their emergence was the most eye-catching hurling plot in 2015 and Waterford’s early 2016 form suggests that was not an aberration. They were more superior than their four-point win last Sunday against Kilkenny indicated and their dominance last night in Páirc Uí Rinn should have translated into a more comfortable success. Still as the only unbeaten side after two games, Derek McGrath’s charges are entitled to be satisfied. They corrected their radar in front of goal last night to post a higher tally with Patrick Curran already illustrating his worth from the outset in this campaign. Despite the fire and brimstone they displayed in the last quarter, Cork simply left it too late to perform a rescue operation on home soil last night. They struggled in Salthill last weekend and found themselves in the slipstream of opponents again against Waterford. Destroyed in breaking ball around the middle third, Cork lagged on the scoreboard until midway through the second-half. It’s still early in the season of course and there’s been numerous examples in recent campaigns that league difficulties can be the precursor to championship promise. But Cork are already under pressure when it comes to beating the drop in Division 1A as the only side without a point to their name. The trip to Croke Park on 5 March assumes greater significance. Trying to ascertain reliable form guides from league hurling can be tricky. Dublin and Galway did their best to encapsulate that last night. Dublin were strong and forceful in winning by seven points a week after capitulating against Tipperary. Galway were poor and sluggish six days after controlling a game against Cork. What’s the true position of either county? We’ll likely find out in the coming weeks. Clare don’t have the fondest of memories of Wexford Park as it was the setting where their reign as Liam MacCarthy holders culminated in July 2014. After last week’s comfortable win over Offaly, today’s trip to the south-east promised to be a more testing examination. It proved to be just that yet Clare impressively dug deep when required. Trailing by three points entering the final quarter, they outscored Wexford by 0-8 to 0-1 to clinch victory. Colin Ryan’s prolific freetaking and a bright show by sub Bobby Duggan proved instrumental in their win. They stay unbeaten, have likely killed off Wexford’s promotion hopes and are already on course for what looks like a critical battle with Limerick on the final day. The most striking result from the opening Sunday of the 2016 hurling league was Kerry clinching the honours away to Laois. After a week where they were showered with praise, it was always going to be interesting to see how they fared in the step up in class against Limerick. Defeat may have been the outcome but running Limerick to four points was clear proof of progress and staying power. It’s a positive start to life in Division 1B and manager Ciaran Carey must be pleased. Email “Kilkenny clinical, Kerry progress, Waterford ride high - weekend hurling talking points”. Feedback on “Kilkenny clinical, Kerry progress, Waterford ride high - weekend hurling talking points”.